Although it is thought of as having been 'written' by Hitler, Mein Kampf is not a book in the usual sense. Hitler never actually sat down and pecked at a typewriter or wrote longhand, but instead dictated it to Rudolph Hess while pacing around his prison cell in 1923-24 and later at an inn at Berchtesgaden. Reading Mein Kampf is like listening to Hitler speak at length about his youth, early days in the Nazi Party, future plans for Germany, and ideas on politics and race. The original title Hitler chose was "Four and a Half Years of Struggle against Lies, Stupidity and Cowardice." His Nazi publisher knew better and shortened it to "Mein Kampf," simply My Struggle, or My Battle. In his book, Hitler divides humans into categories based on physical appearance, establishing higher and lower orders, or types of humans. 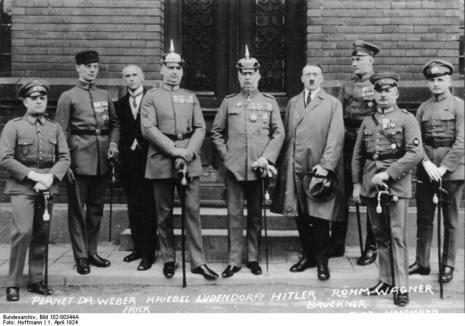 At the top, according to Hitler, is the Germanic man with his fair skin, blond hair and blue eyes. Hitler refers to this type of person as an Aryan. He asserts that the Aryan is the supreme form of human, or master race. When Mein Kampf was first released in 1925 it sold poorly. People had been hoping for a juicy autobiography or a behind-the-scenes story of the Beer Hall Putsch. What they got were hundreds of pages of long, hard to follow sentences and wandering paragraphs composed by a self-educated man. However, after Hitler became Chancellor of Germany, millions of copies were sold. It was considered proper to own a copy and to give one to newlyweds, high school graduates, or to celebrate any similar occasion. But few Germans ever read it cover to cover. Although it made him rich, Hitler would later express regret that he produced Mein Kampf, considering the extent of its revelations. Those revelations concerning the nature of his character and his blueprint for Germany's future served as a warning to the world. A warning that was mostly ignored.